Carrying on his fine form in December, Tony Wood added another one to the trophy cabinet, this time in a Pairs competition with partner Alan Bell, held at Annfield Plain Demi in Stanley over Christmas. The competition was capped at 32 pairs and had some great players in attendance. Wood and Bell knocked out Gary Miller & Phil Borthwick in the quarters, 4-2 to set up a semi final against Stephen Bainbridge and Steven Addison. With Addison and Bainbridge throwing great darts on the day, the champs had to battle through winning 4-2 to set up a final against Joe Gaffney and Kevin McDine. The final was best of 9 and again featured some great darts, with Wood and Bell edging out the Geordie lads to win 5-3. 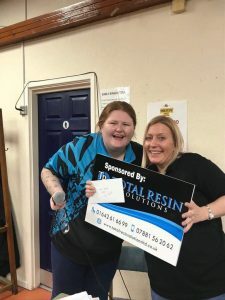 Supa Mc, Kevin McDine was crowned champion of the #1 Total Resin Ranking Event at Billingham Social Club on Saturday. The mens competition attracted 102 players from all over the North East and Yorkshire. McDine defeated Adam Hunt in the final. Claire Stainsby won the Ladies competition beating Kelly Haverson in the final. The youth was won by Jack ‘Maestro’ Male as he defeated Joe Weldon in the final. North East Players Carl Hamilton and Tony Wood travelled to Hull over the Christmas break to take part in a few competitions and both were victorious. Carl Hamilton won the Christmas Competition at the Crows Nest beating Allan Edwards 4-1 in the semi final and Mark Howard 5-1 in the final. The competition attracted 62 players. 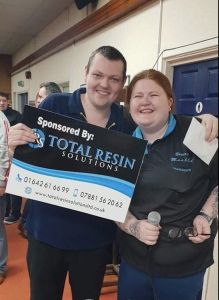 Mr Wood was crowned champion at the Cricket Club in Brampton beating Mike Atkinson 4-3 in the semi final and PDC player Mark Wilson 5-2 in the final with 51 entries. Cam Anderson beats Carl Hamilton in the final at Bonnie Pitt, Easington Lane on NYD. Results from 28th December @ The Phoenix, Hexham. ” Another Fantastic Turn Out For The Blyth Comrades Darts Open..
“Where do you start after night like that in the FCC Christmas Darts Open! An event which usually attracts a good smattering of locals on the Friday between xmas and new year went off the map last night. We knew we were in for a good night at 6.45 as the club filled up but to attract 64 players from all across the region was unbelievable. From Seaham Harbour, Stanley, Sunderland, Washington, Jarrow, Hebburn, Gateshead, Dunston, Swallwell, Blaydon and Newcastle together with a good number of local players it was more like a big Saturday open. 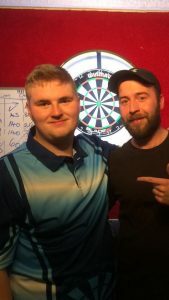 With such a field and FA Cup draw there were bound to be some heavyweight clashes and the draw for the early rounds saw some brilliant darts. 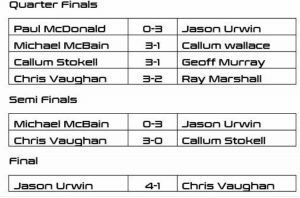 The quarter finals brought together a top line up of players with Jason Urwin, Michael McBain, Callum Stokell and Chris Vaughan progressing to the last 4. 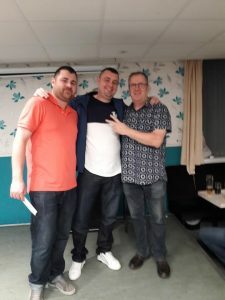 Jason and Chris made it through to the final where despite a valiant effort from Chris it was defending champion Jason Urwin who took the title again with a 4-1 win, the only leg he dropped in the entire night. Sincere thanks to all the players and supporters who turned up from near and far, the spirit on the night was first class from all those involved, never heard one whinge, proper darts players though.